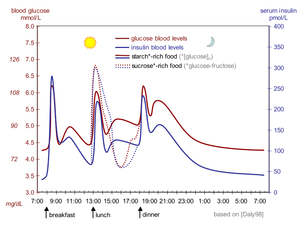 Mechanisms that restore satisfactory blood glucose levels after extreme hypoglycemia (below 40 mg/dL) must be quick and effective to prevent extremely serious consequences of insufficient glucose: confusion or unsteadiness and, in the extreme (below 15 mg/dL) loss of consciousness and seizures. Without discounting the potentially quite serious conditions and risks due to or oftentimes accompanying hyperglycemia, especially in the long-term (diabetes or pre-diabetes, obesity or overweight, hyperlipidemia, hypertension, etc. ), it is still generally more dangerous to have too little glucose – especially if levels are very low – in the blood than too much, at least temporarily, because glucose is so important for metabolism and nutrition and the proper functioning of the body's organs. This is especially the case for those organs that are metabolically active or that require a constant, regulated supply of blood sugar (the liver and brain are examples). In healthy individuals, blood glucose-regulating mechanisms are generally quite effective, and symptomatic hypoglycemia is generally found only in diabetics using insulin or other pharmacological treatment, and in starvation or severe malnutrition or malabsorption (of various causes), and conditions such as anorexia[dubious – discuss]. Hypoglycemic episodes can vary greatly between persons and from time to time, both in severity and swiftness of onset. For severe cases, prompt medical assistance is essential, as damage to brain and other tissues and even death will result from sufficiently low blood-glucose levels. ^ Eiler H (2004). "Endocrine glands". In Reese WO (ed.). Dukes' Physiology of Domestic Animals (12th ed.). Ithaca, NY: Comstock. pp. 621–69. ISBN 978-0801442384. ^ "Diabetic ketoacidosis - Symptoms and causes". Mayo Clinic. Retrieved 30 January 2018.